‘Fruitful discussions’ were held on prioritising the bloc’s policies and direction for the rest of the year, the statement said, with ‘community-building, the strengthening of Asean partnerships with external partners and the international community, and the reinforcing of the Asean-centred regional architecture’ at the core. For Thailand the gathering was the first formal opportunity to flesh out details of its ‘Advancing Partnership for Sustainability’ theme. With core pillars of building a people-centred Asean Community (AC) that leaves no one behind and a strong focus on sustainability, the statement said all present indicated their support of Thailand’s goals, recognising the strong need for additional sustainability measures (See: Thailand to lead Asean with creativity, complementarities and continuity (video)). In the area of trade the group of 10 reportedly agreed on the need for enhanced efforts to bring negotiations of the long-awaited Regional Comprehensive Economic Partnership (RCEP) trade-deal to a conclusion this year. Additional efforts to see the Asean Single Window (ASW) trade document processing gateway become a reality were also acknowledged. 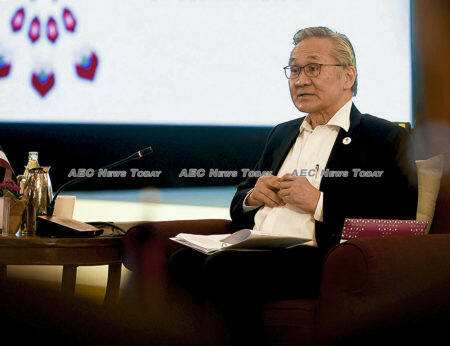 A report from the Asean Secretary-General on the potential political-security and socio-cultural effects of the Fourth Industrial Revolution on member states was acknowledged, along with one commissioned by Thailand from the Economic Research Institute for Asean and East Asia (ERIA) looking at Asean in 2040. The meeting also agreed to further enhance Asean’s newly established Asean-Russia Strategic Partnership, and to upgrade Asean-EU relations to one of a Strategic Partnership. The ‘validity, relevance and importance of the Treaty of Amity and Cooperation (TAC) in Southeast Asia was also reaffirmed. As expected, the need for narrowing development gaps within Asean received particular focus, as too did the need to ‘address long-standing issues that have affected AC building’. Recognising the need for a comprehensive approach to transnational crimes brought about by enhanced regional connectivity, the meeting resolved to strengthening cooperation on border management, while facilitating cross-border trade and the movement of people. The need for enhancing cybersecurity cooperation and the capacity of personnel skilled in cyber incidence response and analysis was also acknowledged, with the meeting noting the commencement of operation in Bangkok of the Asean-Japan Cybersecurity Capacity Building Centre (AJCCBC). Similarly the announcement of the Asean-Singapore Cybersecurity Centre of Excellence was also acknowledged. 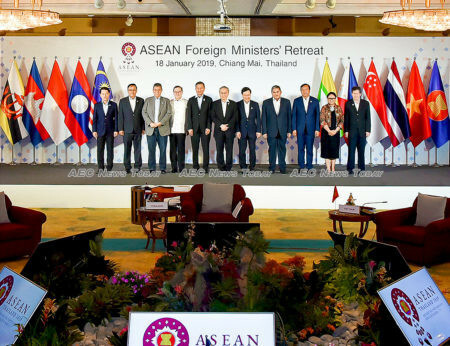 Regional efforts to counter terrorism and violent extremism were also discussed, with Asean foreign ministers expressing their continued support for the ‘capacity-building programmes, joint research projects, and related events’ provided by the Southeast Asia Regional Centre for Counter-Terrorism (SEARCCT) in Kuala Lumpur, Malaysia. 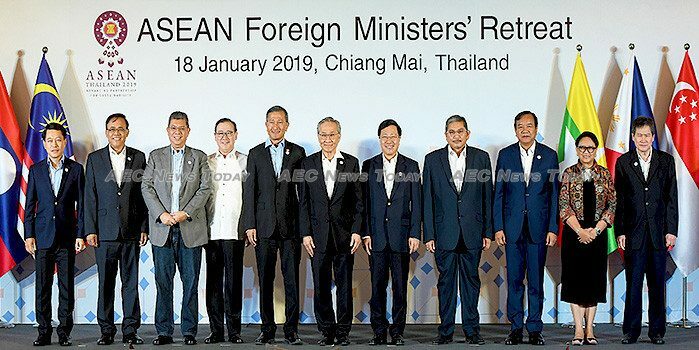 Casting its eye onto regional connectivity, the statement said the meeting ‘recognised the importance and value of building on connectivity strategies at the sub-regional level and enhancing connectivity between Asean and other regions by connecting the connectivities’. To this end, and to facilitate in the sharing of best practices, the promotion of Asean awareness, and a sense of the Asean Community and identity, a network of Asean associations of Asean member states was proposed, possibly signifying an enhanced role for the Asean Secretariat in Jakarta. With the majority of foreign ministers already having returned home the work of making the goals and aspirations of the group begins. To this end there is an additional 75 Asean-related meetings scheduled before Thailand’s fourth period of Asean chair custodianship comes to an end. See here for the full 2019 AFMR Chairs’ statement.